One of my favorite things to do is wander throughout my yard and collect flowers to eat. Some come from my gardens while others from the meadow. This time of year is ripe for some awesome flower picks. Flowers have traditionally been used in many types of cooking from all over the world.There are many recipes that flowers can be added to and some can be eaten on the spot while out on a mornings walk. I hope you to can enjoy the flavor, color, and texture that flowers can bring to your food. Here are a few of my favorite flowers. Common daylily –Hemerocallis fulva . Buds, flowers and bulbs. 3. Nasturtium –Tropaeolum. Flowers, leaves and seeds. 4. Pansy Family –Viola, including wild purple violets and Johnny-jump ups. 5, Musk Mallow –Malva moschata and common mallow. The leaves and seeds are also edible. 6. Red Clover –Trifolium pratense. The leaves are also edible. 7. Dutch White clover –Trifolium repens. Do not eat roadside flowers or those picked in public parks. Both may have been treated with pesticide or herbicide, and roadside flowers are most usually contaminated. Eat only the petals unless you know if the entire plant is edible. If you suffer from allergies, introduce edible flowers gradually. Keep flowers fresh by placing them on moist paper towels and refrigerate in an airtight container. Here is a link for a edible flower chart. There is nothing more easy, stress-free, and delicious as homemade fries. They take a few minutes to prepare, take time in the oven for getting things done around the house, and create little to no mess. We hope that this easy recipe will save you some headaches in your future 🙂 This may seem like a short and simply recipe to be talking about, but honestly we use it so much, and it’s so much better than buying frozen backs of french fries. Cut up your fries. We happen to make these so much that we bought a fry cutter, however, we spent a lot of time before that cutting our fries. Put foil over your baking trays. These will make it so you can remove the foil when you are finished, and have no dishes! Season your fries. I always dribble olive oil over them, then add some Chili pepper, salt, lemon pepper, garlic, sometimes balsamic vinegar, and black pepper. Feel free to use whatever seasonings you like. Bake and wait! 🙂 This is the best part! Bake for 40-50 minutes at 425f and get some stuff done around the house! Be sure to turn/toss them half way through their cooking time! Russel Potatoes, about 2-3 per person. Bake at 425f for 40-50 minutes, turning them half way through their baking time. There is something very delightful about Michigan maple syrup, something that makes my heart smile. Some ingredients have so much potential for a creative mind, and maple syrup is one of those things. From desserts, to granola, to adding a hint of healthy sweetness to any dish, maple syrup is indeed a cooking artists dream! Today I will go the simple route by making roasted maple Brussel sprouts! This is an easy way to watch your husbands face light up when he takes a bite of those “oh so dreadful” sprouts! First get your ingredients together. When you cook with garlic, always mince it first before you start anything else. Remove the outside skin, then place under your knife and give your knife a good pound to pop the garlic! Once the garlic is flat, mincing it will be easier, then allow the garlic to breath for 15 minutes before putting it in contact with heat. This will make the flavor of the garlic more pungent! Garlic added immediately to heat destroys the flavor. If you want to add more garlic, then go for it! Maple syrup is an excellent source of manganese, which plays an important role in energy production and antioxidant defenses, and is necessary for normal brain and nerve function. Next, prep all other ingredients for the pour over “sauce” in a bowl and set aside, then wash your brussel sprouts thoroughly with cold water and vinegar. Now slice off the ends and then in halves, if any leaves come off keep these to put in your dish as well. Then place your brussel sprouts in a baking dish lined with parchment paper, I did not have any parchment paper so I used aluminum foil, I would not suggest this because it isn’t healthy to use. Lastly, pour your mixture evenly over the sprouts. Bake at 400f for 30 minutes, or as cooked as desired. If you want to cut down on cooking time, steam the sprouts before baking them, this will take less time to brown them in the oven, preserve more nutrients, and the taste will be less bitter. The longer the sprouts are left in the oven, the less bitter they will taste. My family was delighted in these brussel sprouts! They went nicely with some baked wild salmon and potatoes! Vegan and easy, they boast high levels of vitamin C, vitamin K, and vitamin B! Some ingredients you could add to make this more unique are crushed walnuts, fresh herbs of choice, bacon, and ginger, these all pair nicely with Brussel sprouts. To stay healthy I like to have vegan or vegetarian days or meals. In America most people have meat or an animal product in every meal. I wanted to share with you what I made yesterday that I thought was really tasty! I love eating vegan or vegetarian throughout the week because it helps cut my calorie intake. I think eating whole foods rather than processed foods is just all around better for me and makes me feel great. I wanted to share the recipes of what I made yesterday because I enjoyed them so much and I thought they were really simple to make. Right now I work/study at home and my husband works all day so I have to make my own meals during the day just for me. Yesterday morning I wanted to make something for breakfast that I could use for lunch and dinner too. To get started I mixed the avocado, garlic, parsley, green onion and cilantro and made almost like a guacamole, this would be great with tomatoes in it too if you wanted to add them in. This ” guacamole” Is what I used through out all my meals I only had to prep it in the morning and the rest of the day I was good to go. I did not add any dairy such as sour cream or cheese so I keep it healthier by not adding in those extras. 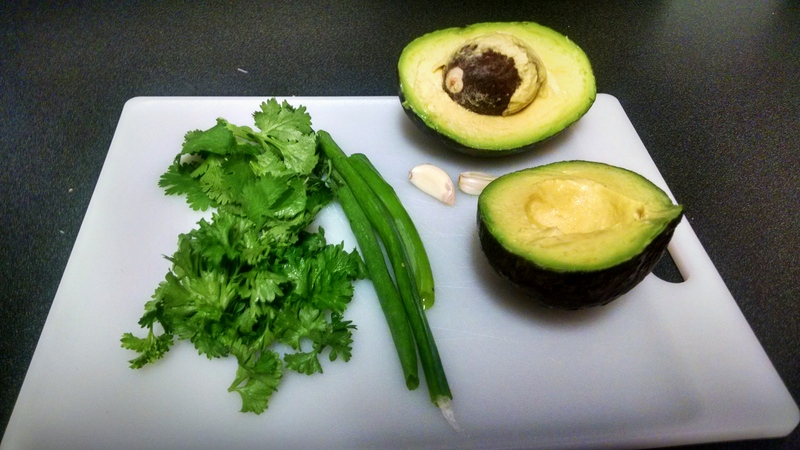 Tip: If you keep the pit of the avocado in the guacamole it will keep it green and fresh all day. For breakfast I had toast with the avocado spread, it was amazing I love avocado, I could eat this every morning for breakfast. I also cut up a pineapple and a banana for a little fruit salad, I love having fruit for breakfast. 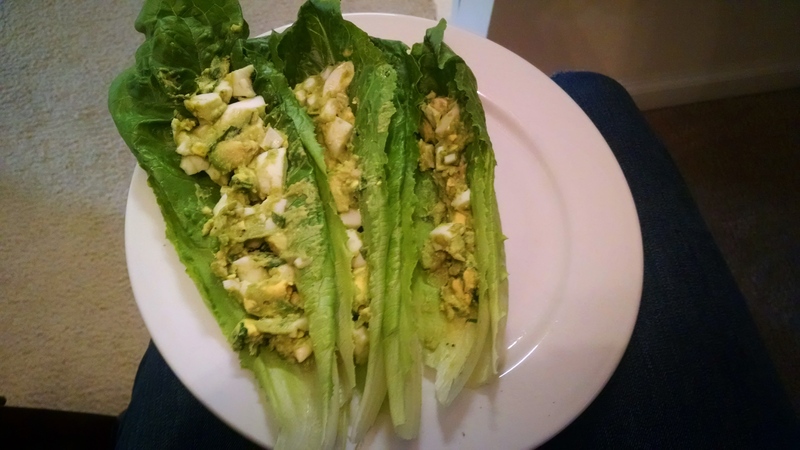 For Lunch I boiled the two eggs and cut them up and put them in with the guac and it made like a avocado egg salad, I smothered it on the romaine lettuce and made it into a lettuce wrap. So DELICIOUS! this would be great with bread too if you needed something more filling. I know that eggs are not vegan but just going vegan for one or two meals is healthier than eating meat or animal product at every meal. You could easily make this vegan by not adding the egg and just having the Guacamole with the lettuce, it would taste just as good, but maybe not as filling. Tip: You could exchange the eggs for chicken and make a chicken salad wrap with the avocado mixture, I have tried it and its delicious and really good on lettuce. For Dinner I baked a potatoe and then poured the rest of the guacamole onto the potato. You could also cut up the potato into fries and bake it on parchment paper (with no oil, they will still get crispy) And use the Guacamole as a dipping sauce. I think Vegans get picked on a lot but really it is a healthy lifestyle if you do it correctly. Ever since I tried to be vegan I have gained some a lot of respect for them and I think It really is better for your body to eat this way. Keep an open mind, and who knows you might just love it! This is a really simple easy full day of meals for one person and it is inexpensive delicious and healthy. I hope you enjoyed my post, if you try out any of these meals let me know if you like them!